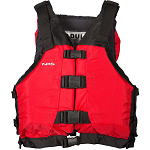 Type V: When you want to float serious water you need a serious life jacket. The NRS Big Water V is a high flotation jacket with a universal fit that wraps easily around anyone's torso. Universal Plus fits: 30" - 58" chest.